This was how profoundly Star Wars had altered the movie landscape in 1977: By the end of the year, any science-fiction film, no matter how different, would have to be measured against it. And films within the same genre don’t get much more different than Close Encounters Of The Third Kind and Star Wars. Even though Spielberg and George Lucas were drawing from the same pool of influences, and even though they were friends who later collaborated on the Indiana Jones movies, their movies about outer space reflected two strikingly different sensibilities. For Lucas, space became a staging ground for a grand clash between good and evil. For Spielberg, it served as a portal to the unknown, highlighting a struggle to understand what lay beyond understanding. Both films were, each in their own way, born of the turbulent times in which the young directors grew up. And both moved beyond those initial influences: Star Wars shed its parallels to the war in Vietnam, while Close Encounters moved beyond its initial conception as a thriller about “UFOs and Watergate.” In fact, the film kept changing shape as it went along. But that’s probably inevitable for a film whose director had been working on it, in one form or another, since he was 17. Spielberg’s first feature-length project, 1964’s Firelight—made for $500 and screened once in Phoenix, where his family lived at the time—concerns a government investigation of alien abductions, a notion that stuck with Spielberg as he became an established Hollywood director. It isn’t easy to see much of the film now. Spielberg lost two of its reels when he loaned them to a production company where he was hoping to work—days before it collapsed. Only a little of the film has surfaced online. What remains looks like the work of a talented amateur, but the project itself doubles as a signpost for where Spielberg was headed: Here was Spielberg, a child of the Cincinnati, New Jersey, and Phoenix suburbs, imagining the most ordinary of surroundings as a staging ground for the extraordinary, just as he would in films he would later direct and produce, from his own E.T. : The Extra-Terrestrial to films set in suburbia and small towns directed Joe Dante, Robert Zemeckis, and others. Every middle-of-nowhere contained the the potential for a remarkable visitation, be it a friendly alien or malevolent spirits. One of his great gifts as a young filmmaker was to invest the mundane surroundings in which so many Americans lived with a sense of possibility—for wonder or terror. Sometimes both. Close Encounters ends with a transcendent moment staged against the backdrop of Wyoming’s Devils Tower, a stunning landmark that looks like no other place on earth. But much of its action takes place in the suburbs and farmlands around Muncie, Indiana, where people in wrinkled clothes and unflattering haircuts live in homes filled with clutter. Family members talk over each other in hopes to be heard. There’s usually a TV on in the other room, even if no one’s watching. (American Movie subject Mark Borchardt has talked about how Close Encounters was the first film in which he ever saw a ranch house. He doubtlessly wasn’t alone in this experience.) Even country idylls weren’t immune to everyday chaos: A single mother’s farmhouse contains a riot of unstowed toys and appliances. It’s everyday life without the messiness ironed away. Into this, Spielberg introduces a mystery. When Roy Neary (Richard Dreyfuss), a humble lineman for an Indiana electric company, investigates a power outage, he witnesses an unidentified flying object, a run-in that leaves him with what appears to be a severe sunburn. Nearby, 3-year-old Barry Guiler (Cary Guffey), follows some lights outside as his mother Jillian (Melinda Dillon) chases after him. Both Roy and Jillian, who soon meet, are fascinated by their experiences, but this feeling soon takes a turn. Having strayed from his duties as a result of his sighting, Roy first loses his job then seems to lose his mind as he becomes fixated on alien encounters while his family looks on in horror. Jillian’s life turns even more dramatic than Roy’s when the UFOs return and draw Barry to them as Jillian fights their efforts to avail, in a scene Spielberg stages like an otherworldly home invasion, with Barry’s unwitting delight only amplifying the horror. Something from beyond Earth has arrived, but its intentions remain vague, as does its respect for human life. Spielberg, who would soon work almost exclusively from scripts originated by others, is Close Encounters’ sole credited screenwriter. That’s apt in the sense that Close Encounters is very much a film by Steven Spielberg, but it’s also a little deceptive. Ray Morton’s through history Close Encounters Of The Third Kind: The Making Of Steven Spielberg’s Classic Film charts the many forms the film took between the time Spielberg first conceived it in the early ’70s and when it reached screens. This included a pass from Paul Schrader that reframed the story as a spiritual crisis. Spielberg hated and discarded Schrader’s script, but it nonetheless pushed the film in a different direction, one that allowed it to explore themes that might have been out of reach for a more straightforward thriller. From there, everyone from Brian De Palma to old friends Hal Barwood and Matthew Robbins made additions, with Jerry Belson, a sitcom veteran who’d recently penned the Michael Ritchie satire Smile, making significant contributions to its later drafts. Yet the finished film is unmistakably Spielberg’s. It finds the director even more in command of his style than in Jaws, from the way he uses faces to express off-screen wonder and, in Kevin Lee’s words, a “childlike surrender in the act of watching” to his willingness to hold on a shot longer than most would dare to achieve an effect, as when Roy, acting on a compulsion, builds a model of Devil’s Tower out of garbage in his living room and almost doesn’t see the news report that will explain his vision to him at last. This is to say nothing of the film’s visual effects, which attempted a merger of the mundane and the spectacular never before attempted and involved talent like 2001: A Space Odyssey veteran Douglass Trumbull, Jaws production designer Joe Alves, special-effects artist Carlo Rambaldi, and cinematographer Vilmos Zsigmond. In the end, the gamble paid off, financially and critically. But no matter how well Spielberg corralled the special effects—whose scale required the use of abandoned Air Force hangars—it wouldn’t have mattered if Spielberg hadn’t captured the humbler elements. Both Dreyfuss and Dillon perform as if, after their respective contact with aliens, their characters are teetering the verge of a collapse. Then, in one scene, Roy stops teetering and goes over. Striving to be normal once again, Roy joins his family for dinner only to find himself unable to stop reshaping his mashed potatoes into the shape that will later reveal itself as Devils Tower. Then, recognizing what he’s doing, he breaks down. Using split focus, Spielberg captures both Roy’s teary attempt to explain himself (“Well, I guess you’ve noticed something a little strange with dad…”) and his oldest son’s half-panicked reaction. There’s no going back form this moment. Soon Roy’s wife (Teri Garr) will take the kids, leaving him alone, one man attempting to decode the universe with seemingly just enough clues to drive him mad. It’s the one scene Close Encounters has to get right in order to work, the moment that grounds its cosmic themes in one troubled protagonist’s personal struggle. Whatever superficial resemblance Close Encounters might have had to Star Wars in 1977, Roy’s scenes as he tries to keep together a life that keeps slipping out of his control has much more in common with something like A Woman Under The Influence. In the end, the film backs away from that scene’s implications, letting Roy follow his otherworldly dreams and leave his family behind without seemingly giving them a second thought. Now a parent, Spielberg has since said he wouldn’t have made the same choice later in his career. 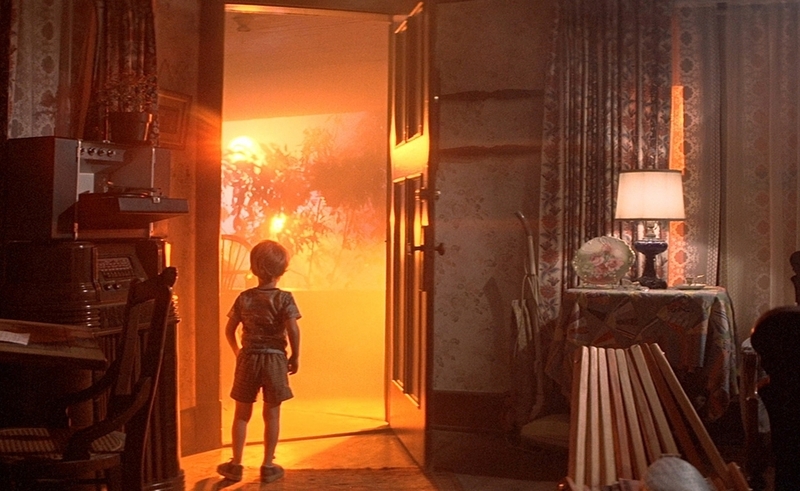 It’s hard to imagine, after the violent aliens in the chilling War Of The Worlds and the darkening of Spielberg’s vision in his later films, that he wouldn’t also change other elements of Close Encounters, which ends with a swell of optimism. After witnessing the first extended contact between humanity and an alien race, Roy gets to leave. Jillian reunites with her son. The government, a shadowy force for much of the film, is ultimately revealed to have everyone’s best interests at heart, guided by the influence of the benevolent UFO expert Claude Lacombe (Francois Truffaut). Close Encounters’ tagline promised, “We are not alone.” The film treats that notion first as a potential threat and then as a reassuring promise. All is well: Not only do aliens exist and they want to be our friends, we’re now ready for that contact, prepared to see what’s on the other side. That’s greatly at odds with the film’s pessimistic, Watergate-era origins, which still inform its depiction of a secretive government, and the dourness with which Spielberg depicts Roy’s life, a struggle grounded very much in the here and now, rather than Star Wars’ galaxy far, far away. But it’s the contrast between the everyday disappointments of life on Earth and the hope for a world beyond those disappointments that drives the film, the notion that maybe there’s not only something greater than the world we know, but that that something might be benevolent and beautiful, that it might come to claim us, flaws and all, as its own. Yet even this hopefulness has its roots in a sense of impossibility. In a 1977 interview, Spielberg recalled the film’s origins in an excursion to the Mojave desert that led him to think, “If something comes down here right now, and lands on the road, and an opening appears, would I get on and take a ride? I thought about it. I looked up at the sky. And I got very, very nervous because I realized that I wouldn’t get on and take a ride.” Roy takes that ride, but the filmmaker always understood that he, like the audience watching, would be fated to watch and wonder—never knowing what’s out there, even if they dared to ask.